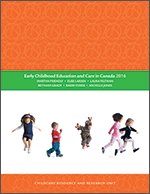 The gap between child care research and policy is growing in British Columbia (BC). While policy changes are what one would expect from the right-of-centre Liberal government, the gap runs contrary to its expressed commitment to the design of early childhood development policy on the basis of ‘science.' The BC child care domain thus provides a rich context in which to examine how ideology mediates the consumption of research in the political arena. This article argues that the government's ‘choice' discourse facilitates the articulation of neoliberal principles in a rhetorically neutral way while casting doubt on scholarship that illuminates gender and class inequalities. Paul Kershaw is an Assistant Professor, Human Early Learning Partnership, Faculty of Graduate Studies, University of British Columbia. This Occasional paper is available in an on-line format only. It is available in this form with the permission of the journal in which it appears, the Canadian Journal of Political Science, December, 2004, Vol. 37.